Norwegian sextet Kvelertak are certainly a band with a vision of who they are. They ignore the tradition of recording vocals in English, choosing instead to perform entirely in their native Norwegian. They release albums at a relatively glacial pace of one every 3 years. And to create their sound they meld black metal influences with unexpected bedfellows: on their debut self-titled it was groove rock like Mastodon, Clutch, and Baroness, whose guitarist designed artwork for follow-up, Meir, where they added a dose of punk rock – of the Refused variety, not the Ramones variety. 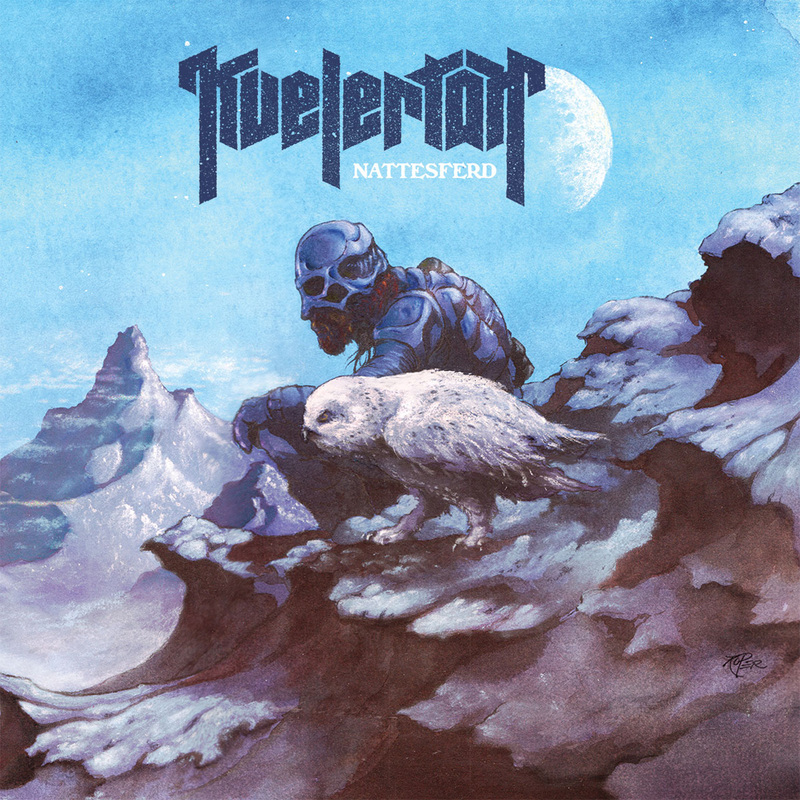 And on third release, Nattesferd, they add a gigantic – and I cannot stress that enough – dose of classic rock…but not the type of classic rock you might be expecting. Lead track “Dendrofil for Yggdrasil” is a brilliant opener and also the least representative track here. It works because it sets the theme for the album while still giving a buffer between long-time fans and some of the pretty extreme new elements they’ve adopted. Opening with black metal howls and blastbeats over a defiantly cheery major key melody, it hits fans with half of this album’s charm up front: Nattesferd sounds happy. The vocals are still as raw and vicious as ever, but the music seamlessly blends cheesy, feel-good classic rock with their previous building blocks of black metal, groove, and punk. In “Dendrofil for Yggdrasil,” that shows especially in the outro, which borrows liberally from, of all places, Tommy-era The Who, right down to the wild drum arrangement by Kjetil Gjermondrod, which is signature Keith Moon. And that’s one of the less surprising influences they turn to before the album ends. Lead single “1985” dives into the fray as a mission statement: it’s time to get wasted. The song’s title is actually an excellent descriptor of the sound: the riff to “1985” sounds straight out of Boston’s playbook, with elements of Styx and The Cars as well, and a dose of Thin Lizzy during the harmonized solos, which take up a good third of the song’s length. The vocals shift away from the black metal of the previous track to a bit more of a raspy, gargling punk scream. It’s still heavy – similar to a slightly wilder Every Time I Die, perhaps – but it gives vocalist Erland Hjelvik the option to make his screams noticeably more melodic. And the combination is fun. That continues on following title track “Nattesferd,” which is not just the best track here, but almost certainly one of the ten best songs of the year. Starting with a punky, sassy bass riff, a few measures in a guitar is added trailing one beat behind, creating an echo effect. Then a couple measures later a second guitar enters a beat behind that, creating a bouncy echo-chamber of a riff… and then a third guitar piles on top with the most badass major key riff of the past few years. In fact, it sounds like it could come from Queens Of The Stone Age’s Songs For The Deaf album, with a desert road, howl at the moon feel. The solo matches this, before ringing out into a nod to The Eagles as the verse riff is reintroduced on jangly acoustic guitars before rebuilding the intro riff in reverse order. The vocals don’t even enter until two minutes in, and I doubt there’s more than a minute of song with vocals actually present, but that doesn’t matter at all. This is a must hear song. “Svartmesse” starts with a guitar chug intentionally similar to “Eye Of The Tiger,” but quickly layers Iron Maiden-inspired harmonized guitars over it. And the band are sly here, as certain instruments will drop a riff and start a new one only to have another instrument jump to the part they left behind, making the song flow extremely smooth, as riffs evolve more often than change abruptly. “Bronsegud” is the only track here under three minutes, and it wastes no time kicking into full gear. The verse riff is led by the bass, which is punky and punchy, which mixed with the classic rock vibe ends up sounding an awful lot like the Foo Fighters. The guitar riff on the chorus also has a pretty strong Dave Grohl feel to it, but the vocals are the angriest on the album, offering a nice contrast. “Ondskapens Galakse” is the first song to even feature a dark or foreboding riff. It’s still not a “heavy” riff, but it has a sort of marching-to-the-gallows feel. The chorus is straight black metal, but the post-chorus is downright soothing instrumental work and one of the best parts of any song on Nattesferd. The outro, on the other hand, is really the only weak part of the album, dragging on in repetition for far longer than it needs to and losing a lot of momentum along the way. Kvelertak gain all that momentum right back with “Berserkr.” Which seems odd to say when I also say this is the weakest track here: it is, but the placement on the album is perfect. The blastbeats and shrieks that kick the song off are an instant wake-up after the drone of “Ondskapens Galakse,” and the chiming chorus riff is one of the biggest earworms on the entire album. It’s by no means a weak song, it just doesn’t feel as phenomenal as the tunes surrounding it. Penultimate track “Heksebronn” is over nine minutes long, and unfolds a piece at a time. The intro once again recalls The Who with chiming, spacey twinkles, but weaving through them is the first truly sinister sounding melody of the album. It builds this way for nearly two minutes before morphing into a bigger, darker, but still not oppressive version of the same riff. The big, slow riffs sound both like The Who and modern instrumental act Scale The Summit. Around three minutes in we get a helping of Pink Floyd psychedelics, then at 3:30 a switch into an acoustic gallop that evolves into a big party-rock hook. It sounds like Every Time I Die performing as Motley Crue, and it’s far more awesome than that probably sounds. Splash on some groove metal and a choir around the 4:30 minute mark and the song should collapse under its own weight, but never does. For the last minute or so things fade out into a modified version of the twinkly intro, bringing the song full circle. Closer “Nekrodamus” is an inspired choice to end the album, with the darkest riff of the album – pure, funky Black Sabbath worship on this one. The tempo is slow and deliberate, especially compared to the hectic eight songs preceding it, the vocals are some of the heaviest, and finally embracing that groove for the last song is fitting. The band don’t leave without a parting reminder not to take things too seriously though, as the very last measure is a warbling surfs-up twang completely at odds with the rest of the song. I’ve name-dropped a lot of classic bands in this review, and that was intentional. On Nattesferd, Kvelertak have created loving, worthy tributes to some of the greatest bands of all time, but not once do they feel like they’re ripping anyone off. These influences are melded so perfectly with their sound that you wonder why they didn’t do this sooner. The evolution is not only natural, it’s clear this is exactly the album Kvelertak both wanted and needed to write, and there is nothing else I have ever heard that sounds anything like this album. To put it bluntly: Nattesferd is GREAT. Last year, it would have taken my award for album of the year, hands down. Only Filter’s near perfect Crazy Eyes prevents that from being the case this year, and if anything else in 2016 tops Nattesferd, then it’s the best year we’ve had for music in almost a decade. I very much doubt anything will, though.